I hope I’m not asking a question that has been asked a million times before.... I just picked up a tomtom satnav pretty cheap in Aldi today, and I’m going to buy the SW Motech handlebar mount and water proof case, so that’s done. My question is around cabling and keeping it water proof when the sat nav isn’t on the bike. 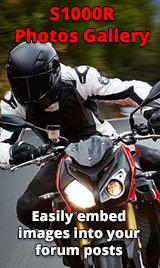 I’m buying the connecting cable from Nippy Norman’s (https://www.nippynormans.com/s1000r-and-s1000rr/lead-for-connecting-any-garmin-or-tomtom-gps-into-the-bmw-harness) and I’m intending on connecting it directly to the USB power cable, but what can I do about keeping them able waterproof when the case isn’t there? Should I be looking at a different connector, or a usb socket type thing?